Blood Oranges and Hot pink Dahlia - Results of a fantastic marmalade! - Canning Homemade! 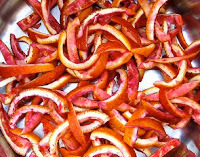 Home » blood oranges » Marmalade » Oranges » Blood Oranges and Hot pink Dahlia - Results of a fantastic marmalade! Blood Oranges and Hot pink Dahlia - Results of a fantastic marmalade! 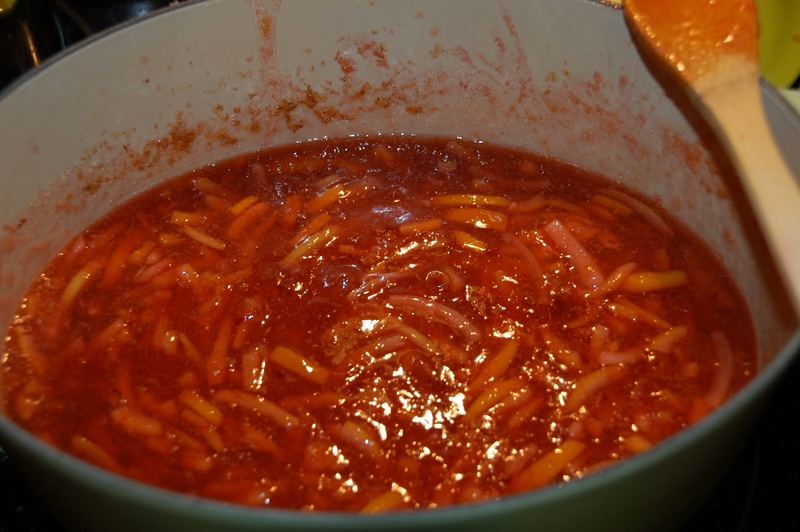 No I didn't combine blood oranges and hot pink dahlia's to make a marmalade, but my follower did! My number one follower, Hot Pink Dahlia put together a "bucket list" for 2011 and one of the items was do more canning over the summer. She wrote me shortly after the new year looking for a recipe for Blood Orange Marmalade. I was eager to help and found a simple recipe for her to put together. 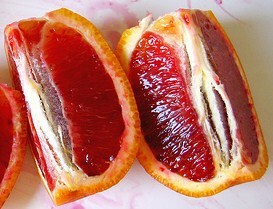 Many people may have never heard or seen a blood orange. Blood oranges are oranges that at some time went through a genetic mutation and turned into the fruits that they are today. Blood oranges contain a pigment called anthocyanin which is not typically found in citrus but rather more common in other red fruits and flowers. Not only is the inside of the orange darkly pigmented but depending on the variety the outside may also have dark washes of red. The three main blood orange varieties are Tarocco, the Moro and the Sanguigno. The Moro is being grown in San Diego, California. 1. Wash the oranges and lemons. 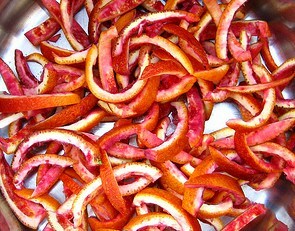 Remove the rinds in quarters and thinly slice them lengthwise. When all the rinds are sliced, roughly chop them crosswise into slightly smaller pieces. Put the rinds in a large pot and add 2 1/2 cups of water and the baking soda. 2. With a sharp knife, split the vanilla bean open lengthwise and scrape the seeds into the pot. Add the vanilla bean to the pot and bring it to a boil. Reduce the heat, cover, and simmer for 15 minutes. 3. Meanwhile, roughly chop the oranges and lemons and remove the seeds. Transfer the fruit to a food processor and pulse until it is evenly chopped but still a bit coarse. Add the fruit to the pot with the rinds and return to a boil. Cover and boil for 15 minutes. 4. Measure out 4 1/2 cups of the fruit mixture. Make sure to get a good mixture of rind, fruit, and juice. Discard remaining fruit mixture and vanilla bean. 5. Return the reserved 4 1/2 cups of fruit mixture to the pot. Stir in the pectin and return to a boil. Boil vigorously for one minute. 6. Add the sugar all at once and stir until combined. Return to a rapid boil, stirring frequently, and boil hard for one minute. 7. 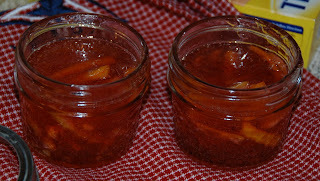 Ladle hot marmalade into hot sterilized jars, leaving 1/4-inch headspace. Wipe rims of jars, cover with lids, and screw bands on until just barely tight. Place jars on rack in pot and cover completely with water. Cover pot and bring to a boil over high heat. 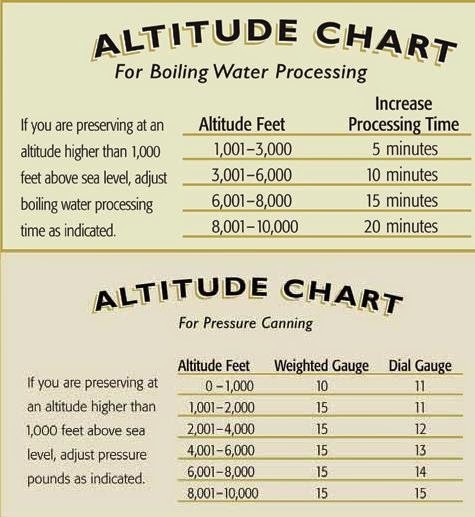 Boil for 10 minutes. Turn off heat, uncover pot, and allow jars to rest in water for five minutes. Remove jars from pot and allow to rest undisturbed on countertop for six hours or overnight. One note: Marmalade may take several days up to a week to completely gel. I am so happy to have been able to post these beautiful pictures courtesy of her hubby! Thanks again Hot Pink... keep the water boiling!